My cross stitch blog! Blog posts all about cross stitch! How to cross stitch tutorials for beginners as well as extra tutorials on how to finish your piece and how to make home decor items from your cross stitch work. A stitch-a-long is an online stitching event where everyone stitches the same pattern/design over a series of weeks or months. So every week you receive a part of the cross stitch pattern, usually through email, but some people offer the paper version too. And everyone who is taking part stitches together (of course you can take as long as you need though). This post is a little different to my usual content, but I adore Pinterest and I wanted to share this for all of my fellow business owners out there (or just those of you who want to improve your personal profile). Pinterest has grown my community more in the past 6 months than 4 years on social media has, and these are the basic steps I followed when I first got started. I am not an expert, but I have done a lot of research and got amazing growth from following these steps. A step by step tutorial on how to make a cross stitch lampshade. 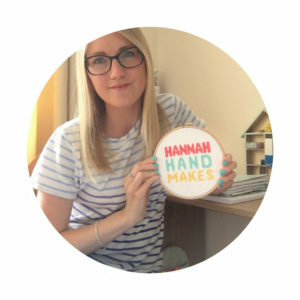 Welcome to Hannah Hand Makes; a place to explore cross stitch and creativity. I am a mum and know all about letting creativity slide during the over whelm. I’m here to take away some of that overwhelm and bring you easy DIY tutorials to infuse more creativity into your life. Many of my tutorials are around cross stitch (because it’s easy!) but you will also find other DIY tutorials here, as well as a dose of motivation if you need a boost.